There are loads of recipes out there for how to use them up, but did you know that every part of them is edible. That includes the skin, the seeds, the shells of the seeds and the soft sometimes stringy flesh otherwise known as pulp surrounding the seeds. You don’t even need to cook them – they are edible raw too! 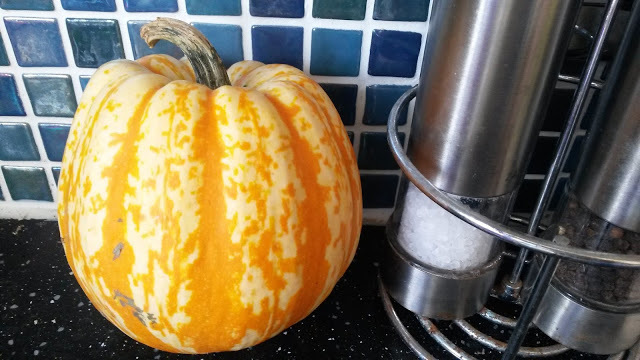 I didn’t used to know that and I would first gut and chuck the innards of my squash or pumpkin as well as peeling it before making it into soup or roasting it (or if I did roast it with skin on I didn’t eat it) – what a waste! You can increase or decrease the level of zero wasteness (if that’s a thing) of this recipe and cost of making depending on how the ingredients are sourced. and you can have your own garlic harvest next year!) and the carrot was shop bought but needed using up before it went mouldy. 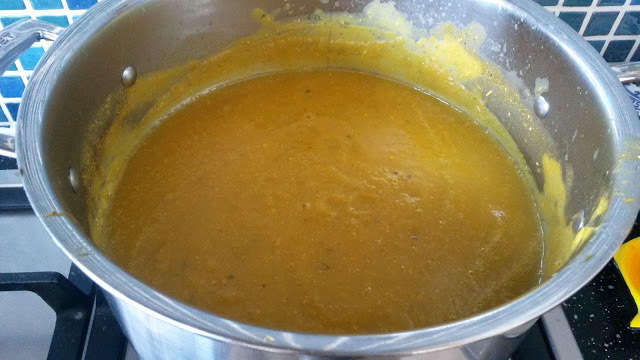 You don’t have to wait for a carrot to go soft before adding it to your soup, but the softer they go the sweeter they make the soup, so don’t even think about chucking out soft carrots! We buy pepper in bulk which is not plastic free, but reduces packaging overall and it is more cost effective than buying a little at a time. My stock was not homemade, but if you make your own stock you can take it a step further than me in the zero waste stakes! Give your pumpkin or squash a wash. Gut the pumpkin or squash, separate out the seeds from the pulp and then chop up the pumpkin or squash with the skin on and put it along with the pulp into your pan. Chop up the carrots into coins (make sure you leave the skin on!) either with knife or a pair of kitchen scissors. Add your stock either homemade or shop bought- make sure all the ingredients are more than covered in liquid and add extra stock if needed. Season with a little pepper to taste – I don’t like to add salt because there is already salt in the stock, but you may want to. Once boiling turn the heat right down, move to a smaller heat source e.g. a smaller gas ring if you have a gas hob and simmer for at least an hour. Once cooked take out the bay leaves and either blitz the ingredients together with a hand blender or leave lumpy! Serve immediately or leave to cool and once entirely cooled down freeze or refrigerate for later use. 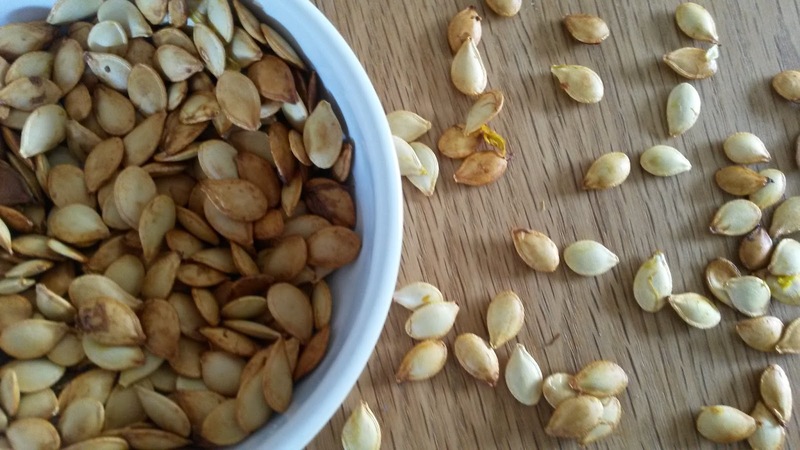 While your soup is simmering you can sort out the seeds. You can save some for planting in your garden next year if you want or you can roast them and eat them whole with the skins on! I’m still not sure if I like them or not, but they are strangely moreish and they make a satisfying crunch when you bite into them! Sprinkle with a little sea salt. You can buy salt in cardboard boxes in some stores – be careful to make sure it doesn’t get damp in storage though as otherwise you will end up with soggy salt! Check/ turn the seeds again and then put them back in for a final few minutes. Keep a close eye on them to make sure they don’t burn. Eat them straight away or when they have cooled down! There are loads more twists and turns you can take pumpkins and squashes in, so next time you feel inspired to cook one remember that you can eat pumpkin and squash seeds, you can eat pumpkin and squash seed shells, you can eat pumpkin and squash pulp and you can eat pumpkin and squash skin! When they are growing the leaves, stems and flowers are edible too! The only bit you don’t want to eat is the dead stalk! This blog post contains affiliate links and anything you buy through them will help to support the blog as I will get a small commission. Thanks! This entry was tagged eco, ecothrifty, family budget, Food, Frugal, gourds, Green, Halloween, home grown, local, paleo, pick your own, plastic free, pumpkin, recipe, seasonal, squash, sustainable, thrifty, zero waste. Bookmark the permalink. ← An Eco Thrifty Update!